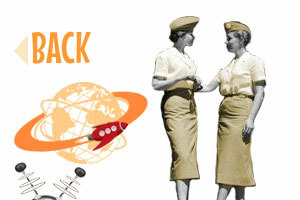 "I've got baloney in my slacks." Animaniacs, was an animated series, distributed by Warner Bros. Television and produced by Steven Spielberg's Amblin Entertainment and Warner Bros. Animation. 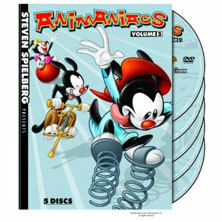 Animaniacs is the second animated series produced by the collaboration of Spielberg and Warner Bros. Animation during the animation renaissance of the late 1980s and early 1990s. 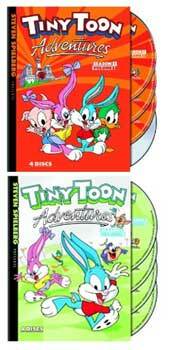 The studio's first series, Tiny Toon Adventures, was a success among younger viewers, and attracted a sizable number of adult viewers. The Animaniacs writers and animators, led by senior producer Tom Ruegger, used the experience gained from the previous series to create new animated characters that were cast in the mold of Chuck Jones and Tex Avery's creations. The comedy of Animaniacs was a broad mix of old-fashioned wit, slapstick, pop culture references, and cartoon violence and wackiness. 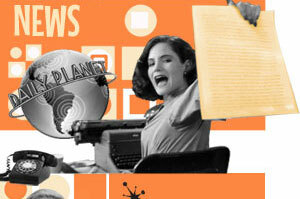 The show featured a number of comedic educational segments that covered subjects such as history, mathematics, geography, astronomy, science, and social studies, often in musical form. Animaniacs itself was a variety show, with short skits featuring a large cast of characters. While the show had no set format, the majority of episodes were composed of three short mini-episodes, each starring a different set of characters, and bridging segments. Animaniacs first aired on "Fox Kids" from 1993 to 1995 and new episodes later appeared on The WB from 1995 to 1998 as part of its "Kids' WB" afternoon programming block. The series had a total of 99 episodes and one film, titled Wakko's Wish. It later aired on Nickelodeon, Nicktoons Network, and Cartoon Network in syndication. Animaniacs had a large cast of characters. The Warners, Yakko, Wakko, and Dot, were three cartoon stars from the 1930s that were locked away in the Warner Bros. water tower until the 1990s, when they escaped. After their escape, they often interacted with Warner Bros. studio workers, including Ralph, the security guard; Dr. Otto Scratchansniff, the studio psychiatrist, and his assistant Hello Nurse. 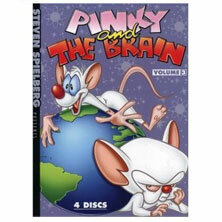 Pinky and the Brain are two genetically altered laboratory mice that continuously plot and attempt to take over the world. Slappy Squirrel is an aged cartoon star that would easily outwit antagonists and educate her nephew, Skippy Squirrel, about cartoon techniques. Additional principal characters included Rita and Runt, Buttons and Mindy, Chicken Boo, Flavio and Marita (The Hip Hippos), Katie Ka-Boom, a trio of pigeons known as The Goodfeathers, and Minerva Mink. The Animaniacs cast of characters had a variety of inspiration, from celebrities to writers' family members to other writers. 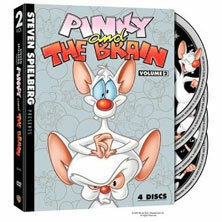 Executive Producer Steven Spielberg said that the irreverence in Looney Tunes cartoons inspired the Animaniacs cast. The general premise of Animaniacs and the Warner siblings were created by Tom Ruegger, who also came up with the concept and characters for Pinky and the Brain. Ruegger was also the senior producer and creative leader of the show. Writer Deanna Oliver contributed The Goodfeathers scripts and the character Chicken Boo. Producer and writer Sherri Stoner contributed heavily to Slappy Squirrel and Pinky and the Brain. Nicholas Hollander based Katie Kaboom on his teenage daughter. Because the Warners, Yakko, Wakko, and Dot, were portrayed as cartoon stars from the early 1930s, Ruegger and other artists for Animaniacs made the images of the Warners similar to cartoon characters of that era Simple black and white drawings were very common in cartoons of the 1920s and 1930s, such as Buddy, Felix the Cat, Oswald the Lucky Rabbit, and the early versions of Mickey Mouse and Minnie Mouse. Many of the Animaniacs voice cast came from Animaniacs predecessor, Tiny Toon Adventures, including the voices of Yakko and Dot, Rob Paulsen and Tress MacNeille, respectively. The voice of Wakko, Jess Harnell, on the other hand, did not come from Tiny Toons, and said that before Animaniacs, he had little experience in voice acting other than minor roles for Disney. Harnell said that at the audition for the show, he did a John Lennon impression. Producer and writer Sherri Stoner voiced Slappy the Squirrel. Stoner said that when she gave an impression of what the voice would be to Spielberg, he said she should fill the role. The voice actress who played the voice of Rita, Bernadette Peters, is a Tony Award-winning musical theatre actress, and Romano herself wanted her for the role. Other voice actors included Maurice LaMarche, the voice of the Brain, Squit, and the belching segments "The Great Wakkorotti" (Jess Harnell said that he himself is commonly mistaken for the role); Frank Welker, the voice of Runt; and various voices by Jim Cummings, Paul Rugg, Vernee Watson-Johnson, Jeff Bennett and Gail Matthius (from Tiny Toon Adventures). Tom Ruegger's three sons also played roles on the series. Nathan Ruegger voiced Skippy Squirrel, nephew to Slappy, throughout the duration of the series; Luke Ruegger voiced The Flame in historical segments on Animaniacs; and Cody Ruegger voiced Birdie from Wild Blue Yonder. Animation work on Animaniacs was farmed out to several different studios, both American and international, over the course of the shows production. 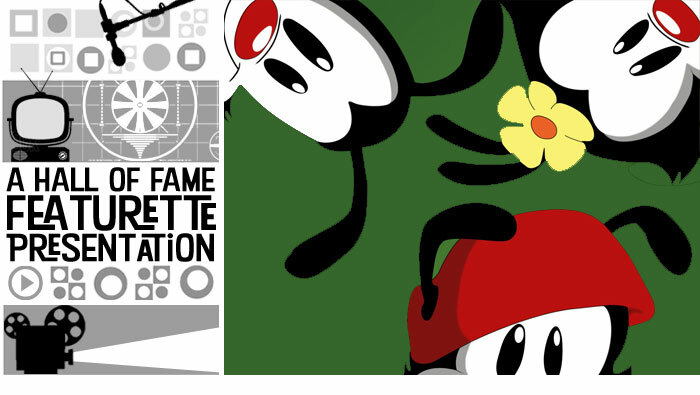 The animation companies included Tokyo Movie Shinsha (now known as TMS Entertainment), StarToons, Wang Film Productions, Freelance Animators New Zealand, and AKOM, and most Animaniacs episodes frequently had animation from different companies in each episode's respective segments. Animaniacs was made with a higher production value than standard television animation, having a higher cel count than most TV cartoons. The Animaniacs characters often move fluidly, and do not regularly stand still and speak, as in other television cartoons. Animaniacs was a very musical cartoon, with every episode featuring at least one original score. The idea for an original musical score in every episode came from Steven Spielberg. Animaniacs used a 35-piece orchestra, and was scored by a team of composers, led by supervising composer Richard Stone. The composing team included Steve and Julie Bernstein, Carl Johnson, Gordon Goodwin and Tim Kelly. 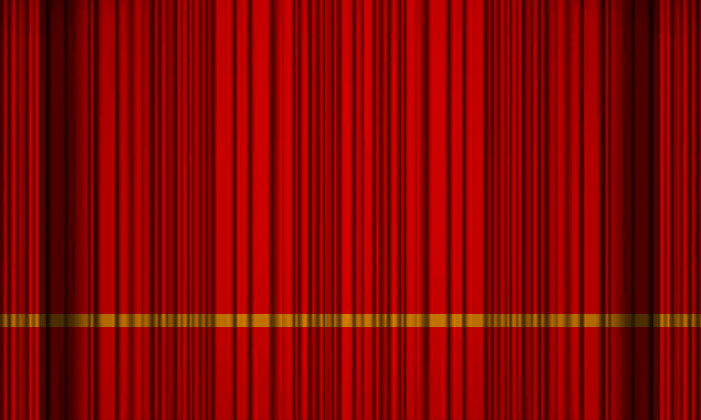 The use of the large orchestra in modern Warner Bros. animation began with Animaniacs predecessor, Tiny Toon Adventures, but Spielberg pushed for its use even more in Animaniacs. Although the outcome was a very expensive show to produce, "the sound sets us apart from everyone else in animation," said Jean MacCurdy, the executive in charge of production for the series. Assistant composers Steve and Julie Bernstein said that not only was the Animaniacs music written in the same style as that of Looney Tunes composer Carl Stalling, but that the music used the same studio and piano that Carl Stalling used. Animaniacs had a variety of music types. Many Animaniacs songs were parodies of classical or folk music with both educational and non-educational lyrics. Most of the groups of characters even had their own theme songs for their segment on the show. The Animaniacs series theme song, performed by the Warners, was a very important part of the show. In the series' first season, the theme won an Emmy Award for best song. Richard Stone composed the music for the title sequence and Tom Ruegger wrote the lyrics. Several Animaniacs albums and Sing-along VHS tapes were released, including the CDs Animaniacs, Yakkos World, and Variety Pack, and the tape Animaniacs Sing-Along: Yakko's World. 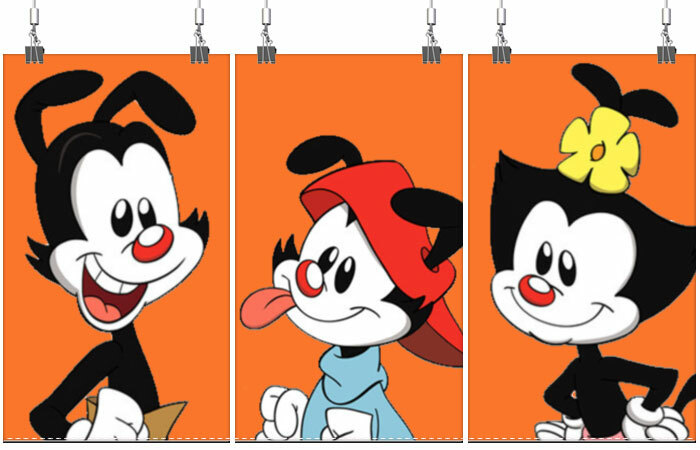 The humor of Animaniacs varied in type, ranging from parody to cartoon violence. 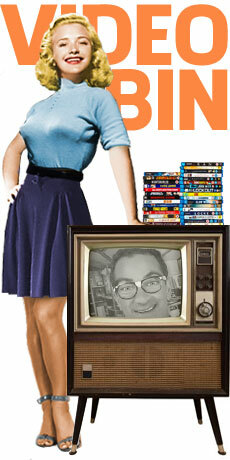 The series made parodies of television shows and films. In an interview, Spielberg defended the "irreverence" of Animaniacs, saying that the Animaniacs crew has "a point of view" and does not "sit back passively and play both sides equally". Spielberg also said that Animaniacs' humor of social commentary and irreverence were inspired by the Marx Brothers and Looney Tunes cartoons. Animaniacs - Behind The Scenes. 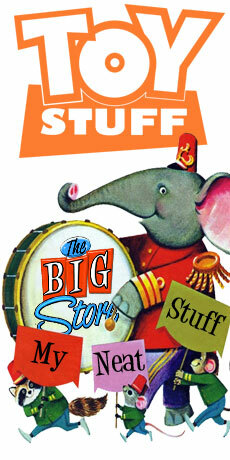 Bonus footage and interviews with animators on how this classic cartoon came together. 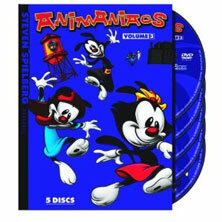 Add Animaniacs to your DVD collection. Before Animaniacs was put into production, various collaboration and brainstorming efforts were thought up to create both the characters and premise of the series. 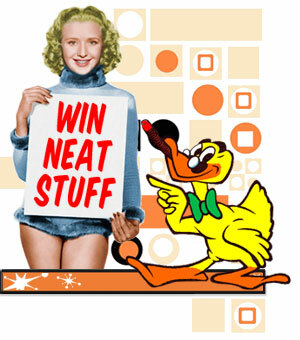 For instance, ideas that were thrown out were Rita and Runt being the hosts of the show and the Warners being duck characters that Senior Producer Tom Ruegger drew in his college years. After the characters from the series were created, they were all shown to Executive Producer Steven Spielberg, who would decide which characters would make it into Animaniacs (the characters Buttons and Mindy were chosen by Spielberg's daughter). The characters' designs came from various sources, including caricatures of other writers, designs based on early cartoon characters, and characters that simply had a more modern design. During its run, Animaniacs became the second-most popular childrens show in both demographics of children ages 211 and children ages 611 but a great deal of Animaniacs' humor and content was aimed at an adult audience who also responded positively to the show which would prove it's undoing. Animaniacs premiered on September 13, 1993, on "Fox Kids", and was on "Fox Kids" until September 8, 1995; new episodes aired from the 1993 through 1994 seasons. Animaniacs aired with a 65-episode first season because these episodes were ordered by Fox all at once. In 1994, Yakko, Wakko and Dot also starred in the theatrical short "I'm Mad". New episodes were aired on "Fox Kids" until the 65th episode aired; Fox then ordered no more new episodes, with the exception of a short, four-episode long second season that was quickly put together from unused scripts during the Animaniacs syndication period on "Fox Kids". After "Fox Kids" put Animaniacs into syndication for a year, Animaniacs switched to the new Warner Bros. channel, "Kids' WB". 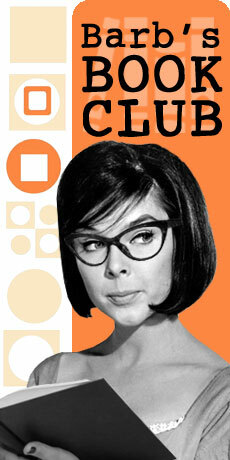 The series was popular enough for Warner Bros. Animation to invest in additional episodes of Animaniacs past the traditional 65-episode marker for syndication. Animaniacs premiered on the new "Kids' WB" line-up on September 9, 1995, with a new season of 13 episodes. At this time, the show's popular cartoon characters, Pinky and the Brain, were spun-off from Animaniacs into their own TV series. While on "Kids' WB", Animaniacs gathered over one million children viewers every week. However, Animaniacs was only successful in an unintended way, bringing in adult viewers and viewers outside the "Kids' WB" target demographic of very small children. This unintended result of adult viewers and not enough very young viewers put pressure on the WB Network from advertisers and caused dissatisfaction from the WB network towards Animaniacs. Slowly, orders from the WB for more Animaniacs episodes dwindled and Animaniacs made it through a couple more short seasons, relying on leftover scripts and storyboards. 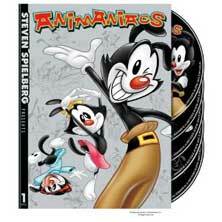 The fourth season had eight episodes, which was reduced from 18 because of the WB's dissatisfaction with Animaniacs. Finally, in 1998, Animaniacs was cancelled by the WB, led by executive Jamie Kellner, who has also been held responsible for the cancellations of Freakazoid! 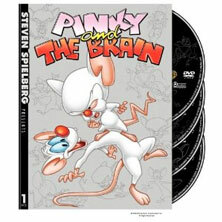 and Pinky and the Brain. The 99th and final Animaniacs episode was aired on November 14, 1998. Afterwards, Animaniacs segments were being shown along with segments from other cartoons as part of The Cat & Birdy Warneroonie Pinky Brainy Big Cartoonie Show. 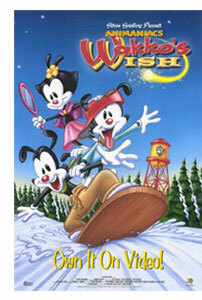 On December 21st, 1999, a direct-to-video movie starring the Warners, titled Wakko's Wish, was released. After Animaniacs, Spielberg collaborated with Warner Bros. 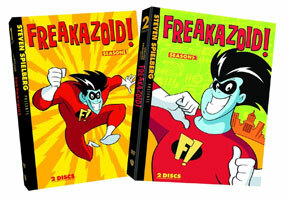 Animation again to produce the short-lived series Steven Spielberg Presents Freakazoid, along with the Animaniacs spin-off series Pinky and the Brain, from which Pinky, Elmyra & the Brain was later spun off. 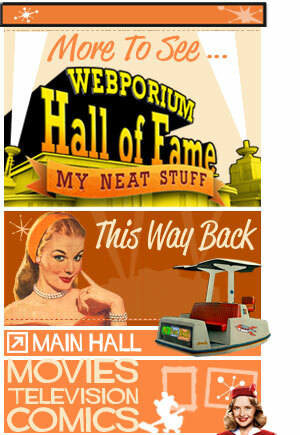 Warner Bros. also produced three other series in the later half of the decade titled Histeria!, Toonsylvania, and Detention. 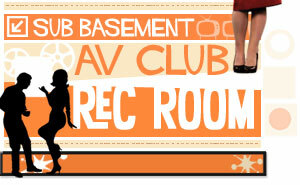 Later, Warner Bros. cut back the size of its animation studio because the show Histeria! went over its budget, and most production on further Warner Bros. animated comedy series ceased. Over the course of the series Animaniacs' won a Peabody Award, was nominated for a number of Annie Awards and won a handful of Emmy Awards. After it's initial run the Animaniacs continued to rerun in syndication through the 1990s into the early 2000s on the Cartoon Network and Nickelodeon.